A savings secured loan uses your personal savings account as collateral. Instead of liquidating your account to make a purchase, you can elect to take a loan against the sum. This works best if you are taking the loan from the same bank where your savings are housed. While these loans are often inexpensive and easy to qualify for, they do come with some disadvantages. Inexpensive: Your savings account stays intact during your loan cycle. You earn a small interest rate on the savings account in most situations. This rate can be deducted from your interest rate on the loan to give you an accurate idea of how much the loan is actually costing. Because your asset grows in value while your loan is paid off, the total expense is smaller. Convenient: A bank that houses your savings will often approve you for a savings-secured loan without too much hassle. They will simply verify the amount you have in reserve and quote you an applicable loan to value ratio based on your qualifications. The loan to value is typically lower than 100%, but it may be higher than the total value of your savings account if you have very high income and a good credit score. Low requirements: Secured loans are easier to qualify for if you have low credit. The bank is risking less because it can liquidate the account at any time if you fail to pay. Borrower accepts the risk: On any secured loan, the borrower takes the risk away from the lender. 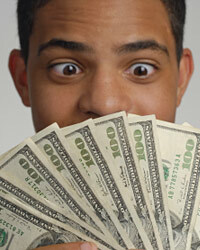 The lender engages in some risk by providing cash to a borrower at the beginning of the loan. The lender is betting the borrower will repay, but the lender does not have assurance of this fact. With a secured loan, the lender has assurance you will repay the loan. If you do not, the lender already has your collateral to make up for the loss. You are risking losing the collateral, but the lender is not actually risking anything. Less credit reward: Secured loans are low risk loans for lenders. As a result, they do not help boost your credit score as much as unsecured loans. Essentially, taking a secured loan shows other borrowers you did not qualify based on your income and credit alone. This means they will be more likely to additionally require collateral for any future loan you take. Interest fees: Liquidating a savings account, though it is risky, comes without interest fees. If you have the cash in savings to make your purchase, you do not need to take a loan. Taking a savings secured loan will always cost you more money than simply using your savings account for the purchase. It may feel better because you still have the cash if you need it in your account. However, you may be prevented from accessing this cash while your loan is still active. This is to prevent you from withdrawing the funds, defaulting on the loan, and leaving the lender with nothing.